There is a big debate in the outdoor community about the merits of pre-packaged food. Of course, that’s not to say that anything that comes in a wrapper isn’t edible, but it does tend to flaunt more multisyllabic ingredients than any item you pull from the perimeter of a grocery store. That said, pre-packaged hiking snacks are easy and convenient, making them great options for day hikes when you just want to grab and go. But, no one wants to eat cardboard, am I right? 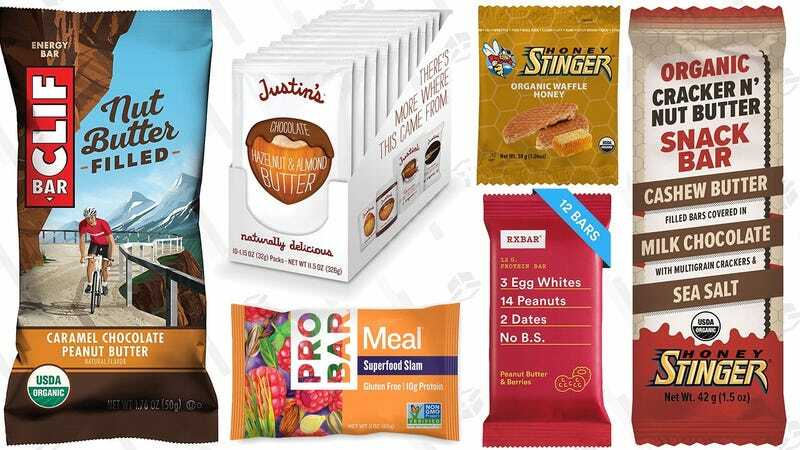 So I’ve rounded up my eight favorite packaged hiking snacks of all time, coming from over 20 years of trail time experience. Trust me: these munchies are so delicious, you’ll find yourself eating them while at home. These looks like mini-Belgian waffles but there is nothing small about the taste. My favorite flavor is the caramel flavor but you can’t go wrong with any of them. With plenty of carbs and honey-based sugar to keep you going, these make a great trail meal and outdoor lore leads me to believe that more than a few people opt to snack on a waffle for breakfast. Pro tip: if the waffle hardens due to cold temperatures, place it over the top of a steaming cup of coffee. Dunk, eat, repeat, and enjoy. Probar Meals are easily the most satisfying option on this list because they are designed as meal replacements. With roughly 400 calories per bar along with plenty of carbs, fat, and sodium, each bar is an easy lunch-on-the trail when you don’t have time to stop and sit. I really love the Peanut Butter Chocolate flavor (because chocolate) but the Superfood Slam is surprisingly tasty. The Skratch Energy Chews are the lone chews on this list for good reason: they don’t stick to your teeth! I don’t know about you but there is nothing worse than huffing and puffing up a mountain, mouth dry from heavy breathing, only to realize you have food stuck to your teeth and it won’t budge. Hate that. Not only do these chews not stick, but they also taste delicious thanks to the real fruit and sugar. Don’t believe me? Try the Raspberry flavor. Ok, I’ll admit that these aren’t my favorite but I know eleventy billion people who swear by them (including my husband) so clearly I’m missing the boat. The brand prides itself on its real, whole ingredients (dates, egg whites, cashews, and almonds) and higher amounts of protein. My husband loves the Chocolate Sea Salt flavor that includes 12 grams of protein. Not too shabby. Once upon a time, I was a broke college student who barely had enough money to pay her rent, let alone buy food. During these dark days, I ate a lot of Clif Bars. Like, a lot. So many that I banished them from my life forever….until Clif launched these glorious Nut Butter Filled wonders. The organic energy bar is filled with nut butter, creating a healthy candy bar of sorts. If I may, I highly recommend the Caramel Chocolate Peanut Butter flavor. Yes, that’s a lot and yes, it’s that good. I’ll be honest: I ate one of these with my dinner last night and I have no regrets. There is a lot going on in these bars: chocolate-dipped multigrain crackers (lightly sweetened with honey, of course) sandwich a sea of nut butter making a salty-and-sweet explosion. They only come in three flavors which are all amazing, and are relatively light on the sugar with 9-12 grams. Four ingredients doesn’t sound like a lot, but trust me: they nailed it. I give credit to a brand who knows their niche and knows it well. Honey Bunchies makes only one bar, focusing all their efforts on a delicious product. Each bar is packed with honey (42% to be precise), peanuts, pecans, and sunflower kernels so you know exactly what you’re getting in every bite. And, if honey is your jam, you’ll likely find a new favorite snack.